For the academic year 2018-2019, the Universitat Politècnica de València (UPV) offers ten consecutive programmes that students may choose when they pre-register. This initiative enables students to take a bachelor's degree and, consecutively, a master's degree, as the UPV guarantees acceptance in the master's degree in question. The aim of this proposal, in addition to fostering student engagement, is to highlight the academic offer of master's degrees associated with regulated professions, while clarifying which bachelor's degrees entail priority access to these master's degree studies. Since the academic year 2014-2015, the UPV has been offering master's degrees that enable students to work in regulated professions in the field of engineering and architecture. This academic year (2018-2019), for the first time, students may choose a academic programme when they pre-register, which will guarantee them access to the corresponding master's degree. 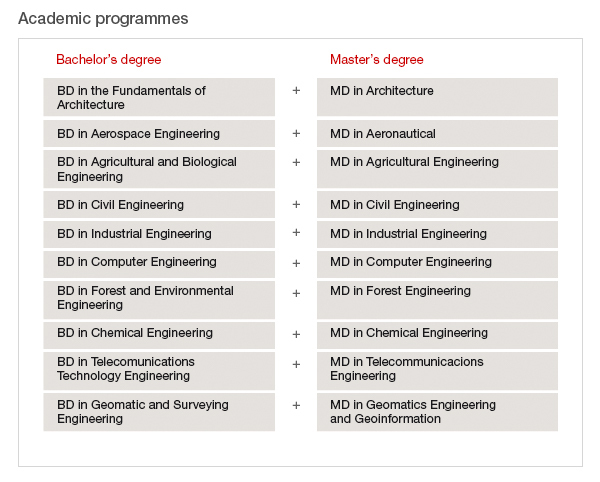 On the other hand, students joining these programmes will not be taking on a commitment to continue to the master's degree: they may give up the bachelor's degree + master's degree programme when they wish. In any case, if at the time of pre-registration students decide not to register for one of the bachelor's degree + master's degree programmes, this will not prevent them from registering for the associated master's degree once they have obtained their bachelor's degree, as long as they meet the access requirements.